If you are curious about the new Tivo LiquidTV software by Nero, you'll want to check out Ben Drawbaugh's review over at EngadgetHD. The review has plenty of screen-shots and photos and goes into the pros and cons of the software. "As TiVo fans we want to like the Nero Liquid TV software and can see two possible ways people might use it. First, there's the obvious roll your own DVR route that will enable you to turn just about any PC into a DVR. The second is as a companion for a real TiVo. The problem with both solutions is the price. Of course, if it did either spectacularly well, then it'd be worth the price, but the fact is it doesn't." 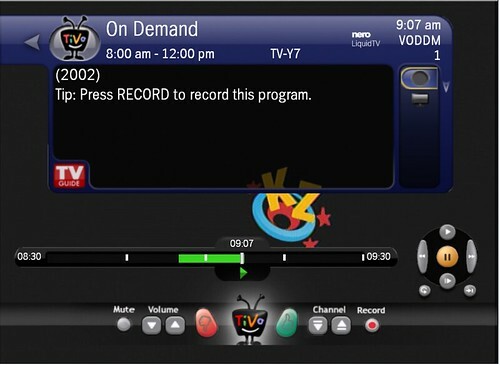 I think it will still appeal to those TiVo addicts who can't live without the TiVo UI, but beyond that I don't see this software doing very well. I'm expecting to see plenty more reviews of LiquidTV soon so I'll be interested in others take on the new software. You can read my original comments on how the LiquidTV software affects the HTPC market in this post.